In July, 1976, during the height of the Cold War, a mysterious broadband, short-wave radio signal started disrupting radio and telecommunications signals all over the world. 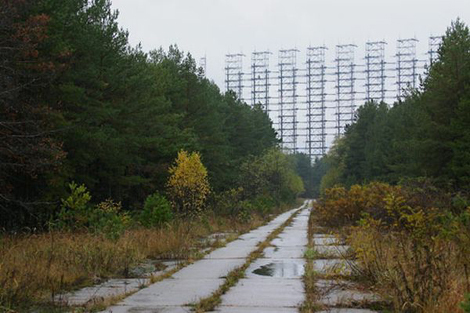 The signals, which continued through December, 1989 with the collapse of the Soviet Union, were traced to a Duga-3 system, part of the Soviet Anti-Ballistic Missiles early-warning network located near the ill-fated Chernobyl nuclear power plant. The signals also disrupted regular and amateur radio and utility transmissions all around the world. Other than being a nuisance factor, nobody could figure out the purpose of the strange radio transmissions. But conspiracy theories began to emerge. Dr. Milton Zaret, an ophthalmologist who was warning about the effects of microwave radiation on the human eye, was retained by the government to investigate the “Moscow Signal” because the U.S. Embassy in Moscow was being subjected to what officials feared was a microwave beam. Zaret’s work prompted author and investigative science writer Paul Brodeur to publish his book, The Zapping of America in 1977, which proposed that the Russian Woodpecker transmissions were in some way harmful to humans. Writer Ira Einhorn, in an article published in the 1977-78 edition of CoEvolution Quarterly took the issue one step farther. Einhorn proposed that the radio waves were part of a sinister mind control experiment and that the Russians were attempting to brainwash the non-communist countries. He coined the word “psychotronics,” as the system being used by the Russians on Americans. Einhorn, who is remembered as one of the founders of the first Earth Day event held in Philadelphia in 1970. He was later sentenced to life in prison after conviction in the murder of Holly Maddux, a former girlfriend, whose body was found in Einhorn’s apartment in 1979. Einhorn claimed he was framed by the CIA because of his investigations into Russian psychotronics. After the collapse of the Soviet Union, the Russians said the radio signals were linked to the nation’s defense system and never had anything to do with global mind control technology. Einhorn’s theories, however, were supported by military intelligence officer Lt. Colonel Thomas Bearden, now retired, who traced the signals from an installation at Riga and Gomel, both near Chernobyl. He said they were being produced by a Tesla generator and that he believed the signals were responsible for weather modifications. He blamed the signals for a drought that caused major effects on farm crops in 1976. Following Bearden, numerous professional people jumped on the bandwagon and offered similar conclusions. CIA Director Allen Dulles joined them in April, 1953, when he gave a lecture at Princeton University. He warned that the Soviets were advancing in the field of mind control and brainwashing. It was in 1984 that Dr. Ross Abey, chief of research at Pettis Memorial Veterans Hospital, California, produce what he called a “mini-Woodpecker transmitter (LIDA)" that he claimed was given him by a Soviet colleague. The device, which operated at a frequency of 40 MHz, bombarded the brain with low frequency radio waves. It acted like a tranquilizer, leaving the subject in a trance-like state. Abey claimed that he found data that described the Woodpecker as a “distant pulse treatment apparatus” with the potential of affecting a large number of people. Thus we must ask the question . . . can such a device be causing the mass impassive mindset in so many Americans today? Is this why people fail to revolt against the banks and big corporations that blatantly steal our nation’s wealth and force people to work like slaves on dead-end jobs? Is the Russian Woodpecker still at work, but now in the hands of the world power brokers?